About 7.2 million Venezuelans participated in the elections organized by the opposition in rejection of the Constituent Assembly. Venezuelans rejection to President Nicolas Maduro’s plan to rewrite the Constitution of the country was imminent. According Cecilia García Arocha, rector of the Central University of Venezuela, 7,186,170 votes were in favor of the opposition. Although the votes were a symbolic act, they represent fully the main objective of the opposition, the party of Mesa de la Unidad Democrática (MUD), which is to let the world know that the changes that Maduro wants to achieve are rejected by most Citizens of that Nation. 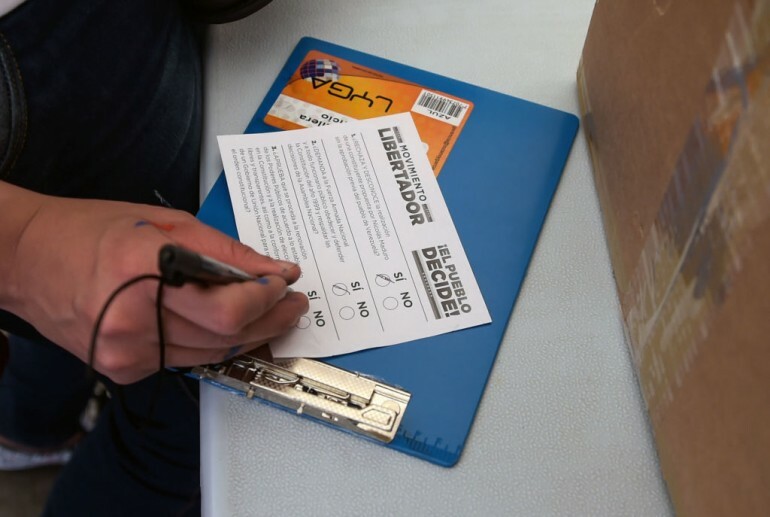 CNN en Español reported that during the plebiscite voters responded "yes" or "no" to three questions. Where more than 98% of voters rejected the proposal of the Constituent Assembly; called on the military to defend the existing constitution, and gave its support to new elections before Maduro's term expires in 2019. 1. Do you reject and ignore the realization of a constituent proposed by Nicolás Maduro without prior approval of the people of Venezuela? 2. Demand the National Armed Forces and all public officials to obey and defend the Constitution of 1999 and support the decisions of the National Assembly? 3. Do you approve the renewal of public powers in accordance with the provisions of the Constitution and the holding of free and transparent elections, as well as the formation of a government of National Union to restore constitutional order? According to the National Assembly, 667 polling stations were set up in 100 different countries to participate in the popular consultation. Among them are Saudi Arabia, Chile, Australia, New Zealand, Germany, Oman, United States, and Dominican Republic. See below the thousands of voters who responded to the call around the world. In Venezuela, the polling station closed at 7 PM, but the voting didn’t end in a peaceful manner. Collectives related to the regime of Nicolas Maduro shot against the voters. The attack killed Xiomara Escot and injured at least three other women. They also kidnapped journalist Luis Olavarrieta, who was later found beaten in a medical center, according to The Guardian. It's good to remember that the oil-rich nation is facing a humanitarian crisis. Food shortages, skyrocketing inflation and a plummeting currency are just a few issues that caused Venezuela to become a "Failing State." The country's current poverty is due oil, the same thing that made it rich. Venezuela has the world's largest oil reserves, being the U.S. its biggest customer. Former President Hugo Chavez, who died in 2013, controlled oil profits. Chavez allegedly used all the money in education, health care and employment, but all that spending left Venezuela in recession. Now the opposition of the new goverment is brutally repressed with bullets, water tanks, pepper spray and tear gas by the Venezuelan riot police.